Celebrate the July 4th holiday TOGETHER with a fun and memorable Family Camp! Family Camp offers optional and exciting daily Camp Bethel activities, open pool, 7 meals, (coffee service for the grown-ups!) and summer fun for 3-days and 2-nights including games, hiking, singing, swimming, creek-play, Bible study, crafts, a nature lesson, and nightly campfires. Tag along with a camper unit and let the Counselors lead your family in our excellent activities, or relax as a family making your own schedule. Check-in at 4:00pm Sunday; check-out at 6:30pm Tuesday, after a July 4th celebration/picnic. Your family will lodge in your own cabin or lodge room. Mixed families and friends are welcome to join you. Fun for all! Fee = $120/person ($120 for each add’l person), and toddlers age 2 and under are free. 1. Make your payment below through our secure "Register Now" PayPal button using any major credit card or a PayPal account. You must pay in full to register on-line. There are no additional fees or surcharges for on-line registration, and you will be able to review your fee prior to payment. $120 of your payment is considered your deposit and is non-refundable unless Camp Bethel cancels the camp program, (see "Cancellation..." information below). 2. Submit Data: After paying successfully, PayPal will direct your browser to our secure on line 2017 Family Camp Registration Form (which is a Google Form). Allow at least 15 minutes to complete, and be as thorough as possible before you SUBMIT the form. If your browser doesn't redirect you to the Family Camp Registration Form, please access that form HERE. 3. Get your Confirmation Packet: After submitting your Family Camp Registration Form, ​your browser will direct to Camp Bethel's Confirmation Packets page (for you to print). We'll also send you an e-mail with links to your packet which includes your gear list, a required Health Form (to be completed and returned to Camp Bethel) and important information about your program. Please notify the camp office 540-992-2940 or CampBethelOffice@gmail.com in advance if your camper will not attend this session. Campers are expected to attend this camp in its entirety. Late arrival and early departure is discouraged, but allowed in case of illness, family emergency or conditions beyond control. 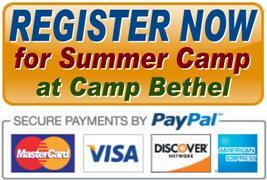 (1) $120 of your fee is non-refundable unless Camp Bethel cancels the camp program. (2) If complete payment of the camp fee (or scholarship approval or Good-As-Gold form) is not received 14 days prior to your camp date you will forfeit your reserved spot. (3) There are no refunds for cancellation of reserved spot in camp within 14 days prior to your camp date. (4) There are no refunds for partial camp attendance or early departure for any reason unless Camp Bethel cancels the camp program.